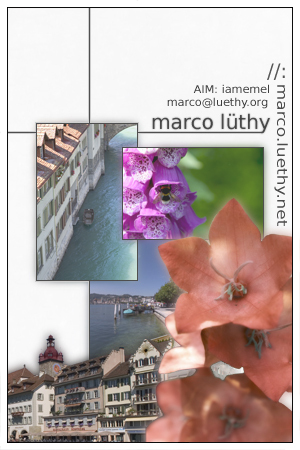 The Dilapidated Marco Luethy Weblog - Weblog > Slow, But Comfortable. Heh.. Ah yes, another entry..
Friday was slower day, though just as eventful as any.. In the morning i listened to music, lay around in bed because it was raining and cold outside, and was on the Internet a bit on my grandparent's computer. I committed all the blog entries i had written in Switzerland up to now to my website, and uploaded some of my better photographs to my deviantart account..
After lunch, and some more Internet time my grandpa, Andrea and i went up on a mountain called Ahorn, which was where my parents had their wedding dinner.. I drove up and back down.. Heh, woot.. lower alp small, narrow roads.. Much fun.. Heh.. When we returned, around 2 hours later.. i played around in photoshop for many hours until dinner at around 1930.. I made l new DeviantArt ID thingo.. Its the image up there ^ heh. Howrah? I like it.. In the evening, i did some more stuff in photoshop, played some Call of Duty, replied to email and chatted with some people briefly and.. then.. well, that was it. Got an email from Cory Franklin. Saturday, today, was slow as well, but i didn't mind. For lunch we had spinach, apple, another vegetable which i can not remember the English word for, and another fruit which i can not remember the English word for-cakes. In other words, 4 separate cakes with the said ingredients in its own separate cake. It was really good. Heh.. After lunch Andrea and I played GTA: Vice City on my laptop a bit, i checked my email on my grandparents computer, and so forth. In the late afternoon i went with my grandma on a little walk into this small forest right by their flat. I wanted to go outside, and i wanted to go into the forest and take photos, and she came along. I'm sure she was pretty bored while i sat there setting up and taking each shot i saw, or wanted to try out.. heh. While i was setting up a shot, i looked to my left and there i saw this beautiful fox with a very bushy tail just walking by. My grandma and i were pretty still, so the fox must have not even seen us there.. It was awesome.. I didn't get a photo of the fox because i was to busy watching it.. and my camera was faced the complete opposite direction, was on manual focus, low on the ground with the shutter speed set to one second.. So, any attempt to take a photo of the fox, which was already moving away quickly, would have been delayed by me moving the camera to point it at the fox, then adjusting my camera's mode from manual to something more sensible for a moving subject.. Yea.. 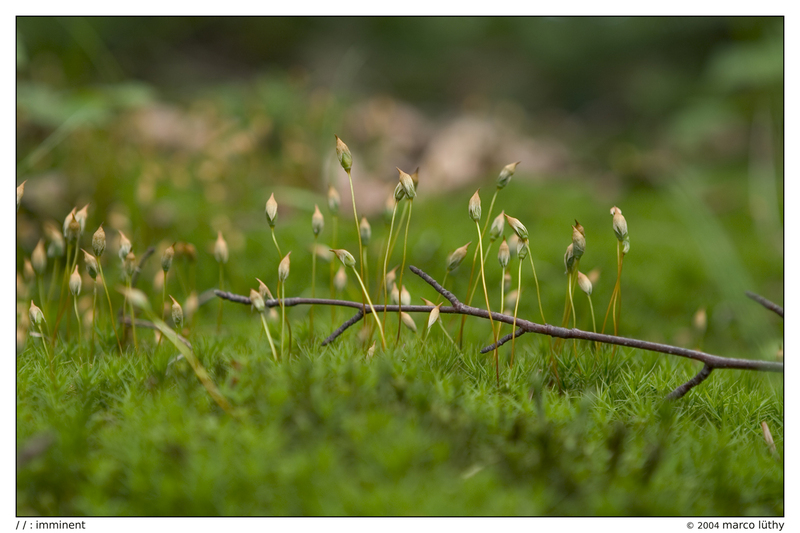 I have yet to review the photos from that little wander through the forest.. When my grandma and i returned, i started copying the 93 raw image files i took in the forest to my laptop and then we had dinner. After dinner, Andrea and i traded off some more playing GTA: Vice City a bit.. I then got online and chatted a bit.. and.. Here i am, now.. Typing away at this. Throughout today so many various subjects poped into my mind of things i could speculate, contemplate, or ramble about.. But now that the time comes where i would wish to actually do so, i can not come up with anything to write about.. The more i try to think up something, the more empty my mind becomes..
A photo frommy little stroll in the forest.. I think i'm most happy when I'm by myself, out and about, somewhere interesting, but peaceful.. Though, occasionally emotions of loneliness sweep over me, and i yearn for companionship, touch; someone. To state the obvious, touch from family such as a sister, a brother, or a parent, is not the same as touch from a friend, or someone else non-blood or family related.. Where am i going with this? Heh, no where, really.. I suppose just one of said sweepings has dawned over me, and i feel a bit lonely. Lonely not in a sense of being alone, without anyone else around.. But lonely in a sense of companionship, i suppose. However, this poses to be a riddle in itself because on another front i find myself to be too independent for any sort of companionship in a relationship's sense.. Nor do i want this. Ideally for me, a friend whom i can trust, be close with, hug and cuddle, and speak to about a plethora of topics and not get in any sort of disgruntling arguments would be the answer to my companionship-lust.. But, as i've already queried, where am i going with this? As i've said, no where, really.. I seek only to ramble, and this i do believe i am achieving.. In the light of rambling, i continue, moving onto my next topic- that is, once it comes to mind. (I really should learn proper usage of the comma. I do believe i slaughter its usage. Some tips/help, anyone?) I wonder what i shall do here for the next 6 months. Where shall i go, what shall i see.. I don't yet surely know.Though, i am already aware that i do not think i can be with my grandparents the whole time. I feel i am a burden upon them. But, to whom would i not be? Heh.. How will i get around once my friends who are coming here-leave, and my Rail pass expires? I certainly do not wish to be in one place all day, every day.. One or Two days of doing nothing is fine, and usually quite enjoyable, though with any more, things become stale and a bore.. I do not know. Today, i came across Laura's xanga blog. All of the three entries that she has written where more or less focused on her God, how she praises him, lives for him, and other similar phrases concerning her and her Lord. In no way do i want to belittle her, or her beliefs, or those beliefs of any others, and for that matter, neither do i want to insult anyone who is reading this.. I have a hard time grasping the ideas which Laura, and many other's, have accepted. I have a hard time grasping the ideas of any religious variance.. Crudely put, i don't grasp them, i reject them. This makes those who do accept said ideas sad.. Sad for me because the ideas they have come to grasp suggest that because i do not grasp said ideas i will suffer some kind of eternal damnation upon understood end of life. This, in turn, makes me sad, because i do not want people to be sad for me on these terms. Relativity plays a big role here. Point of views do as well.. It's hard to step away from whatever side and see it from all angles. People tell me that they pray for me, to which i have no reply.. It means a lot to those people who say this to me, but to me, it means much less. To me it means that these people care about me, and seek in their beliefs a spot to hold me for eternity. To them, it means something similar, but with a greater being-figure involved, somehow. I know the basic principles of Christianity, or similar religions where a Jesus, and a God character play roles.. The goal, if i may call it this, is to reach a paradise, a heaven in the life after death.. Why do i need someone to set goals for me? I am my own being, and fate certainly does not stand well with me being my own being. Life after death, to me, would be something to dread.. Personally, i want to live my life as i wish to live it, without any sort of higher interference, and when my life comes to an end, i want that to have been it. I want to fade from time, i want my consciousness to vanish. I believe in Darwin's theories of evolution, though i can not deny the eerie fact that humanity seems to be the only life form on this planet to have evolved with a consciousness. However, i can also not help but seriously question the many teachings and scriptures of the Christian bible, or similar "holy" text's..
At times, i have viewed religion as a tool of torture upon humanity, that is to say.. Without religion society would be greatly different. Humanity wouldn't quarrel about which religion got it right, wouldn't argue about who's religion is greater, terrorist's wouldn't kill people in their God's name, war's wouldn't be fought in the name of a religion, nor would holy crusades (which i find repulsive, and will never hold faith in such religions which sanction such acts.) exist or have existed. Discrimination would have a tool less for categorisation, and WWII and many prior wars would never have taken place as they did in our history. Whether humanity with religion is good, or bad, whether humanity without religion is good, or bad, is, once again, purely left for relativity and interpretation by ones views. No "side" will ever be satisfied, or be able to agree with the other. So, ultimately my whole little rambling here is more or less pointless, and holds only value by it allowing me to explore the thoughts within my mind.. Inevitably, aforementioned persons who pray for me will find something new to pray about, or rejuvenate their prays which they hold for me because of my ramblings, and others, perhaps, disgust or disappointment, and yet others still, will feel agreeable. I suppose, i do not understand religion. I don't understand faith in a religion, and i find myself somewhat disgruntled when hearing of people living their lives for some greater thing, and not themselves, at least something more realistic.. But, i suppose it is all too realistic for said people.. So, once again, i do not understand. I'm not very sure what it is or was that i was or am trying to say, after all, i am just rambling, and my ramblings often hold no great purpose, but to simply partake in the act of rambling. However, a greatly scrutinised rambling it was.. Heh.. Continuing with my rambling.. Whenever i hear one side of the family speak about or of the other side of the family, i sense this undertone of dislike for the other.. That is to say, whenever someone on my dad's side of the family (The Lüthy's) makes reference to someone on my mom's side of the family (The Sommer's) there seems to be some trace of distaste.. When i last saw my grandma on my mom's side, she was sure not to-and did not-fail to reminded me how in the past years, i equally divided my time with both sides of the family. Staying half the time with my grandparents on my dad's side of the family, and the other half with my grandparents, cousins, aunt and uncle on my mom's side of the family.. The balance i juggle in my hands is stressful, and unnecessary. I understand that both wish to see myself, but mainly Andrea equal amounts of time.. It used to be that i preferred to be with my grandparents on my mom's side of the family, not because i liked them better then the grandparents on my dad's side of the family, but simply because it was more eventful there because my cousins, aunt and uncle also live there, all on a large farm (large is relative to the locale). This year, i feel less inclined to divide my bedding-location equally. I find myself to be more comfortable residing with my grandparent's on my dad's side of the family.. Heh, i dunno.. I seem to have run low on my rambling-fuel.. It's midnight, and i think it would be best if i got some rest..